The configuration database provide access to a centralized database where type specific information can be stored and received. config_db can contain scalar objects, class handles, queues, lists, or even virtual interfaces. The database has both a name table and a type table and each resource is entered into both. Resources are stored in a database so that each resource can be retrieved by name or by type, and database is globally accessible. uvm_config_db::set and uvm_config_db::get methods are used to store and retrive the information from database respectively. • T is the type of the element being configured. Type can be scalar objects, class handles, queues, lists, or even virtual interfaces). • cntxt is the hierarchical starting point of where the database entry is accessible. • inst_name is hierarchical path that limits accessibility of the database entry. top. * - all of the scopes whose top-level component is top. • field_name is the label used as a lookup for the database entry. • value is the value to be stored in the database. Below example shows, setting the interface handle intf, type mem_if, label mem_intf with global scope. 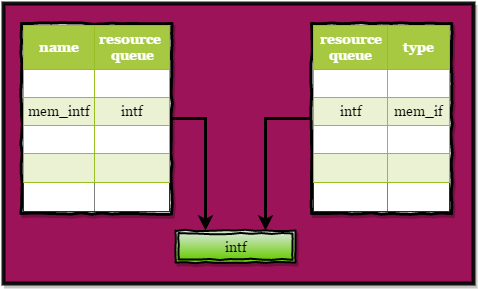 The above diagrams illustrates how a resource whose name is mem_intf and type is mem_if is stored in the pool. • value is the variable to which the value is to be retreived from the database. * The other fields are same as in set method. The method returns 1 if it is successful and 0 if there is no such resource of this type in database. Below example shows. Using the get method to get virtual interface handle from database and assigns it to mem_vif. If get method fails, the fatal message will be displayed.